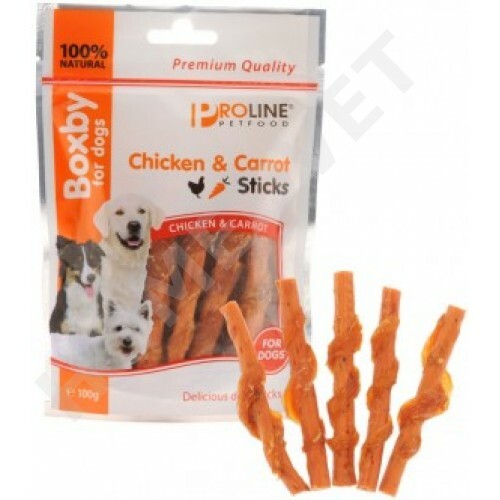 Boxby Chicken & Carrot Sticks are made of carrot, naturally rich in calcium and vitamin C and wrapped in delicious chicken for an extra bite. They are a nutritious dog snack with lots of vegetables and meat! Composition: Meat and animal derivatives (chicken 100 %). vegetables (carrot 100%). derivatives of vegetable origin. cereals. minerals. Additives With colorants. antioxidants and preservatives (EU certified). Not suitable for dogs younger than 9 months.